You may have seen the Story in USA Today late last month about a 4-H alumna who participated with her students of 57 years ago to tell about the first day they were involved in the integration of the first white school in Virginia. We decided that Women’s History Month was a perfect time to tell our readers a little more about this former 4-H’er and her experiences. Even though she has lived about 10 miles from the National 4-H Youth Conference Center, her busy life had kept her away. Her 4-H visit to Washington, DC, preceded the establishment of the National Center and even the first National 4-H Camp on the mall. However, she remembers her trip here as if it were yesterday. Her first trip to the National 4-H Center was a memorable one for all of us who met her. Martha Ann Riggs went to Washington, DC, as one 12 “Corn Champions” from Indiana according to a 90-year-old newspaper clipping from the Evansville Courier that she showed me recently. And guess who was in the photo with her? Well, who else but President Coolidge and the other 11 Indiana 4-H Champions who had won their trips in many other fields besides Corn. Miss Riggs, now 104-year-old Martha Ann Miller of Arlington, Virginia, was the State Baking Champion and the youngest member of the delegation (at 14) by several years. But the interesting story about this “young woman” doesn’t end there. Not only did she receive a trip to Washington DC, she also was awarded a four-year scholarship to Purdue University (the first home economics scholarship ever given to a 4-H’er in Indiana) as a result of baking the best loaf of bread from among thousands of young 4-H’ers in her state. She went on to tell me, “I had quite an impressive summer that year. Since we also had hired help on the farm for the season, I did a lot more baking than usual. I had made 1,200 biscuits, 600 loaves of bread, and more than 500 pies, in addition to cakes, cookies and other treats.” Luckily for her, Purdue held the scholarship for her for five years until she finished high school. When asked what she regards as the most significant event in her life, she doesn’t hesitate to say that it was winning that 4-H scholarship for four years of college. Since she had two brothers, and was a Depression Era farmer’s daughter, she says that she would not have had a chance to go to college at all without that scholarship. This story may sound similar to many stories we’ve heard about 4-H’ers today or in years past, and like many other 4-H stories, Martha Ann’s continues to amaze. 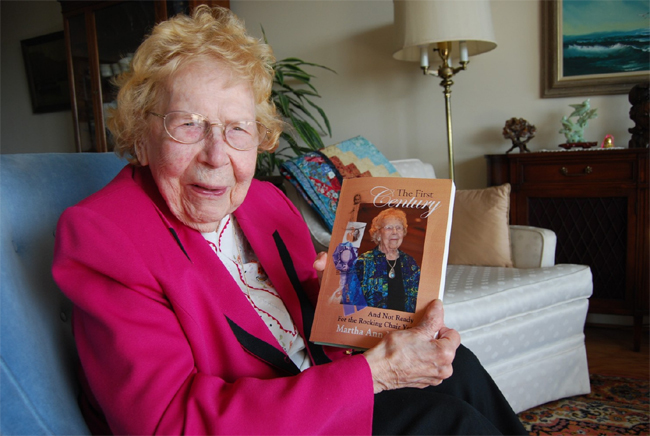 The reason I was alerted to find and meet this woman is that at age 101 she decided to write her first book. She says, “I never dreamed of writing a book until I found myself telling about events of the past that were exciting, full of history and unique.” When I last spoke to her she was talking about writing a book about her husband next because he was a very interesting man and did a lot of good things for his community. After her children were all in a good public school environment, Martha Ann pursued her professional calling as a junior high home economics teacher. She says her Purdue University home economics qualifications led to a 21 year teaching career in that school. However, after one year, the state made science a mandatory subject for 8th graders, which meant that one subject had to go: home economics. Luckily, Martha Ann had taken night classes to be certified as a math Teacher since she had found difficulty earlier in finding openings for home economics teachers. So, she was able to move into that position where she stayed for the next 20 years. How can one put such a fully-lived and productive life into a few short sentences? Since it’s not possible, here’s the information about her book so that you can read it for yourself. The First Century, And Not Ready for the Rocking Chair Yet, Amazon, by Martha Ann Miller. This entry was posted in History and tagged Martha Ann Miller by Sue Benedetti. Bookmark the permalink.